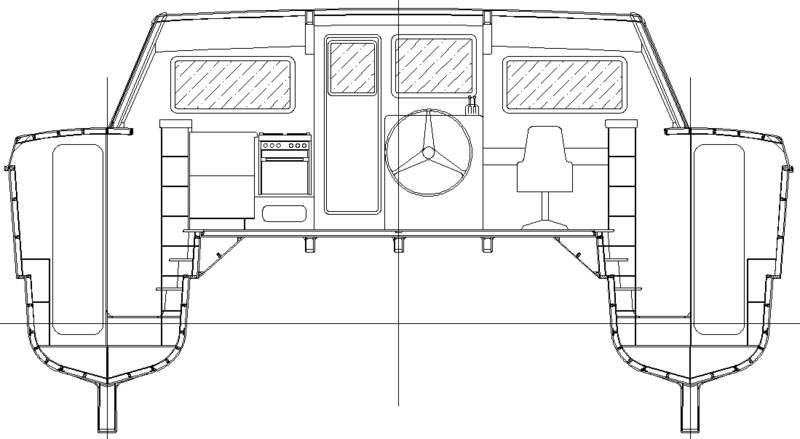 When drawing the bigger sisters, I received mulitple enquiries about smaller sisters in the 38-43ft range. It has taken a long time for this to work through to completion but here it is. This is a popular size because of a good combination of accommodation and performance. It has the size to cruise a family for crossing oceans or a large group of friends for lazing aound the Caribbean and similar destinations. 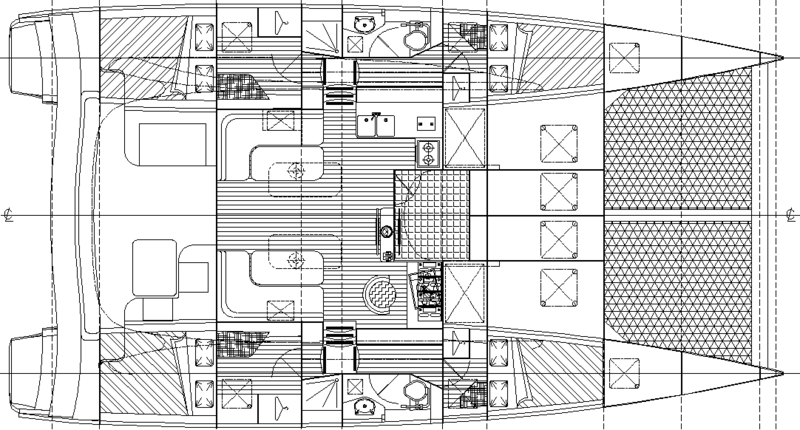 With berths for 8 in 4 equal cabins, this layout will work for crewed or bareboat charter, or an alternative of a 6-berth layout with owner's suite in one hull may be an option for the future. The bridgedeck saloon has an L-shape settee each side, each with a hi-lo table so that they can be used as a pair of dinettes, a pair of casual coffee tables or one of each. Forward of them are galley to port and nav station/office to starboard. The inside helm at the front of the saloon has a compact working cockpit in front of it. The cockpit has all lines led to it for sail and rig control. It also has an outside helm, the wheel fitted on the same shaft as the inside helm. Access to the bows for anchoring, mooring etc is quick and direct. The aft cockpit shows a small dinette on starboard and a flat for reclining on port but this area can be customised to suit the owner's needs. Access to the stern steps is through the aft beam, with one step up from the cockpit floor surface to preserve the integrity of the aft beam as a primary structural member. Aft of the beam the bridgedeck extends aft to form a full-width dock. Construction is a modified version of the same radius chine plywood methods that we have used for monohull designs for 25 years. Originally developed for my own Didi 38 prototype "Black Cat", it is also used for the bigger cats in this design range. The main difference is the addition of a stepped chine to increase interior width for wider berths and more volume, without increasing waterline beam and hull drag. 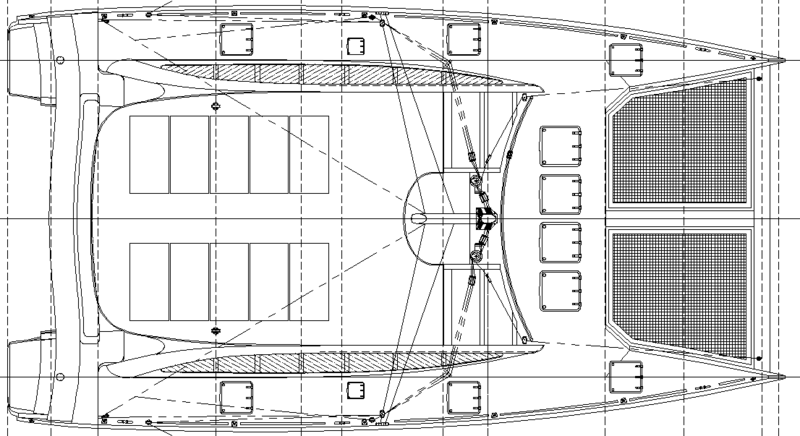 The structural junction between hulls and bridgedeck includes a splayed area that triangulates the structure for greater stiffness and strength. Services can be run inside ducts within the splayed volume and the escape hatches are also in this area. The underbody is clean, with the radius chine shape working well for catamanans. It has fixed cruising keels and an option of daggerboards may be added later. Spade rudders are operated by Spectra cables that run inside conduits in the bridgedeck floor. The mast is supported by upper and lower shrouds and has double diamonds on single swept spreaders. The mainsail is fully-battened, with a square head. 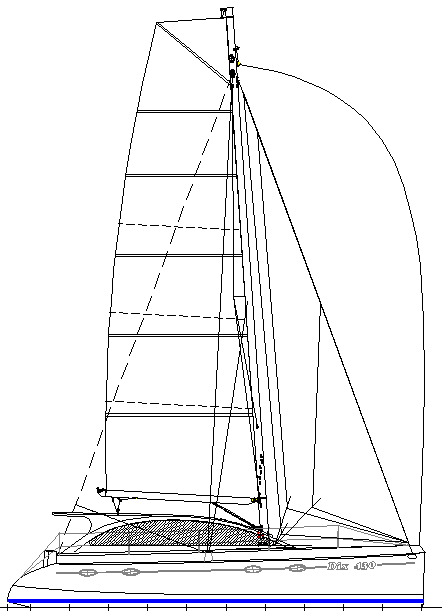 The headsails are sheeted to a radiused track on the foredeck. An asymmetrical spinnaker tacks down to the bows and sheet to the quarters. All sheets and halliards are led to electric winches at the forward cockpit. There are also runners to reduce mast and rigging loads with the spinnaker in stronger conditions, with the runners and retrieval lines also led to the cockpit. Auxillary power is from a pair of 30hp diesel motors through saildrives with folding propellers. Tankage is in tanks on the bridgedeck forward of the galley and nav station, 575 litres each. The Dix 430 can be built from plans and offsets or we can supply optional full-size Mylar patterns of the major bulkheads. A third option is to buy a pre-cut kit of plywood components from Exocetus Marine.Their kits will be available by mid-2019, with options to buy a partial or full kit, from bulkheads only through to all plywood components. If you need a larger cruising cat than this 43 footer, look at the Dix 470 and the DH550. Our plans are drawn to metric scales but include inch dimensions.